RT LIVE is a new type of data logger, with full access enabled over a wireless 3G internet connection. Data files stored on the unit can be accessed over the internet, and all inputs to the device can also be monitored in real time over the internet using any web browser (including Apple and Android products) as well as on a PC. General variables e.g. fuel level, water temperature etc. Send simple messages back to the car dashboard, e.g. "Pit Now"
Live data telemetry can be viewed in two ways, either in an internet browser (PC, Android, iOS device) or on a PC with an internet connection using the Live Monitor software. Using an internet browser the update rate is 5Hz, whilst using the Live Monitor it is 10Hz. For basic applications the unit can be used standalone and in this case the installation is very straightforward. 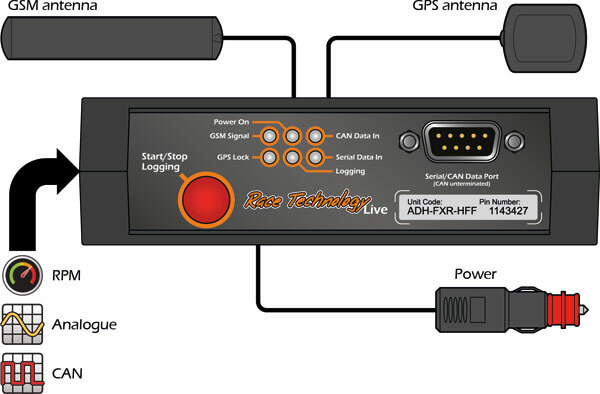 Simply connect 12V power from the vehicle, along with the supplied 3G and GPS antennas and it is ready to stream live data or record data to its internal memory for periodic download over the internet. For more advanced applications the unit can be used as part of a system that includes almost any combination of Race Technology products (such as the DASH2 PRO and DL1) as well as external CAN sources and analogue sensors. All information is continuously uploaded over a 3G connection to a server. When a 3G connection is not available the data is buffered in the RT LIVE internal memory and uploaded to the server the next time a 3G connection is available. Once uploaded, the data is securely stored on a cloud server as standard format Race Technology data (RUN) files which are compatible with all Race Technology software, including the comprehensive data analysis package. RT LIVE includes an internal rechargeable battery to ensure that the unit can continue to operate and upload any buffered runs if the external power supply is interrupted. 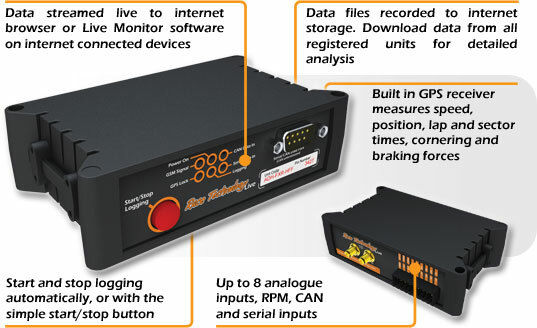 Data streaming is automatically started and stopped based on either vehicle movement, or whenever the unit has power, alternatively it can be controlled manually from the start/stop button on the RT LIVE, or a connected Race Technology DASH4PRO dash display unit. Each RT LIVE unit is registered on the Race Technology website before first use. Either a single unit can be registered to an account, or a batch of units can be registered together for ease of management of a race series. The SIM card is permanently embedded in the unit and is managed on a straightforward PAYG method, with a payment gateway on the web interface to purchase credit as required. GSM antenna is mounted on the inside of the windscreen. The GPS antenna must be roof mounted to produce accurate results (racing). For lower accuracy applications (general vehicle monitoring) it may be acceptible to have the antenna mounted on the dashboard or rear parcel shelf. Do not mount in direct sunlight! Do not mount near sources of heat! The RT LIVE has a wide voltage input range of 9v-30V. When operating the unit needs about 1A, and when in sleep mode requires just 15mA. Due to the low sleep mode current, the unit can typically be connected to a permanent or switched supply. However if the unit is to be fitted in a vehicle that is used infrequently, it is advisable to use a switched supply. Before it can be used, the RT LIVE unit needs to be registered. Firstly, register for an "RT Cloud" account, and then you need to register your "RT LIVE" unit in that account. Click on the link to register a new account, and fill in the details. Once registered and logged in, go to the "account" tab. At the top of the screen you are prompted to enter the "Unit Code" and "Pin Number", this information is printed on the front of the RT LIVE unit. When the unit detects movement it will wake up and connect to the RT server. It will check if newer firmware is available and will update if required. The unit will start recording data once it has a GPS signal and there is movement, to get a GPS signal the vehicle will have to be outside. To test the unit, go for a short drive. When the RT LIVE to the "RT LIVE" with the live monitor PC program. When there has been no vehicle movement for 4 minutes, it will stop uploading the data to the server and mark it as finished. The completed journey or run will be listed on the home page. After 10 minutes of no movement, the RT LIVE unit will go into a sleep mode to save power.